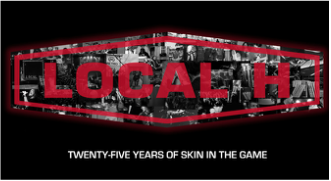 ​Local H: Twenty-Five Years of Skin In the Game chronicles our first quarter century through stories, photos and other memorabilia. It’s the perfect read for when you’re sitting around listening to our records. The tracks on the playlist below are meant to fill in the blanks. Some demos and alternate takes -- most of which we haven’t made public before. It’s a peek at our process — and Local H history for your ears. That takes care of four of your head holes -- the other three are your responsibility. So thanks for buying the book — and thanks for the years. 22 - Clap, You Philistines!